Vienna (AFP) - Austria's far-right Freedom Party (FPOe) secured Saturday its return to power in a coalition with the conservatives, capping a year of successes for Europe's nationalist movements. The anti-immigration party obtained the interior, defence and foreign ministries, but the incoming interior minister Herbert Kickl insisted that "nobody has anything to fear". The chancellor-elect, Sebastian Kurz of the conservative People's Party (OeVP), stressed also that the new government, to be sworn in next week, was pro-EU, although it would press for Brussels to have less say in national affairs. "We have agreed a clear pro-EU stance with the aim of boosting subsidiarity in the EU," Kurz told a news conference, favouring an EU that is "stronger in big questions and which should step back on smaller issues". In addition, while the new government favours more Swiss-style "direct democracy", there will be no British-style referendum on Austria's EU membership, FPOe chief and future vice-chancellor Heinz-Christian Strache said. "We stand by the European Union, we stand by the peace project of Europe. But we see various developments critically, and we will of course articulate this and seek partners," Strache told reporters. Strache, 48, has in the past been ambivalent about EU membership, calling Brussels a "bureaucratic monster" and saying that Britain will "probably be better off" after it leaves the bloc. Kurz, 31, who will become the world's youngest leader, took over the reins of the OeVP in May, and swiftly pulled the plug on its unhappy "grand coalition" with the Social Democrats. Kurz -- dubbed "wunderwuzzi" or "whizz-kid" -- rebranded the party in turquoise as his own personal "movement" and secured first place in snap elections in October after yanking the party to the right. The FPOe came third with 26 percent of the vote, which was double the stunning 13 percent notched up by the far-right Alternative for Germany (AfD) in elections the month before. Both Kurz and Strache won over voters by stoking concerns about immigration following a record influx in 2015, mirroring elections elsewhere in Europe this year. Geert Wilders' Freedom Party became the second-largest in the Netherlands, Marine Le Pen of France's National Front was in a runoff for the presidency in May and the AfD entered the Bundestag. But the FPOe, which was last in government in the early 2000s, is rare in western Europe in having translated its ballot box success into real power. Last year it also came close to winning the largely ceremonial presidency. Speaking at a far-right congress in Prague on Saturday, Wilders said the FPOe's entry into government was "an excellent result". Le Pen called it "very good news for Europe". Strache's "electoral success shows that the future is of a Europe of peoples," Le Pen said. "Every election shows a form of rejection of the EU." The joint programme says that Austria will seek to stop illegal immigration and ensure that people whose asylum claims are rejected are quickly deported. Asylum is "temporary protection" only. Those "refusing to integrate must expect sanctions" and "parallel societies" must be prevented, it says. Citizenship for people not born Austrian will only come "after a successful integration process". There will also be a halt to people coming to Austria to claim benefits, the programme says. Monthly payments to those with asylum and subsidiary protection will be cut to 365 euros plus an "integration bonus" of 155 euros. In addition, labour laws are to be loosened, taxes will be cut and bureaucracy slashed. Austria, the programme says, is "world champion when it comes to regulation and limiting freedom and personal responsibility". 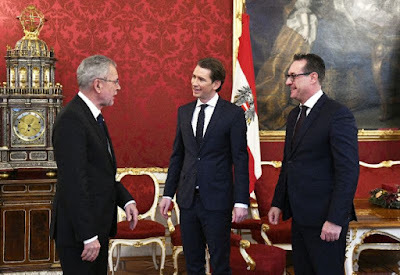 "In my talks with Heinz-Christian Strache and the FPOe I experienced a willingness not just to work together but also to bring about real change in Austria," Kurz said, promising a "new style" of government.